We take great care in stocking the items every horse owner needs. Whether you have an easy keeper or a high level competitor, we have everything you need for your horse including nutrition, tack and equipment, riding apparel, horse clothing, grooming, and horse health care. Equine nutrition can be particularly complicated. Our knowledgeable staff can help point you in the right direction for your horse’s nutritional needs. 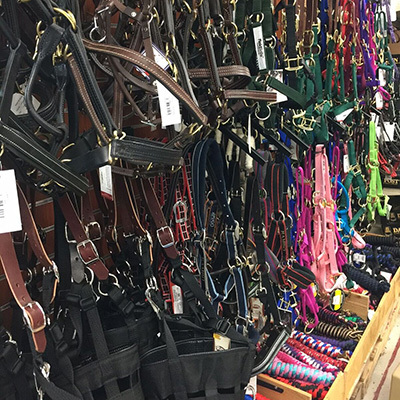 We carry all of the brands the top trainers, clinicians and veterinarians recommend like Purina, Triple Crown, LMF, Equis, Standlee and more. Brands you can recognize and trust like Farnam, Equerrys, Horse Guard, NW Horse, Vita Stress, Absorbine fill our supplement and grooming aisles. Don’t see what you need? We are happy to place special orders so you get exactly what you want.